Sunflowers offer much in the garden. Their bright, yellow heads add vivid color to the landscape while in bloom. Even after they wither, they produce large, edible seeds that are enjoyed by both birds and people. Sunflower seeds have many uses, from eating as snacks to adding them to baked goods as a nut replacement. Gathering and storing the seeds properly ensures they will taste fresh whether you eat them the next day or enjoy them over the winter. Cut off the sunflower head once most of the petals have fallen off and when the back of the flower turns brown. Leave 1 foot of the stem attached to the seed head when you cut it off. Rub your hand over the seeds. If they don't easily detach, place the seed head inside a paper sack and store it in a warm, dry room for one to two weeks until the seeds finish maturing. Rub the seed head after the drying period to release the rest of the seeds. Place the seeds in a sealed container if you are using them only for birdseed. Store in a cool, dry area until ready to use. Roast sunflower seeds prior to storing if you will be using them in the kitchen for human consumption. Spread the seeds out in a single layer on a roasting pan. Roast in the oven at 300 degrees F for 30 to 40 minutes. Salt if desired, then store in a sealed container for up to two months. Cover the sunflower seed head with a paper bag or nylon stocking if squirrels or birds are stealing the nuts before they mature. 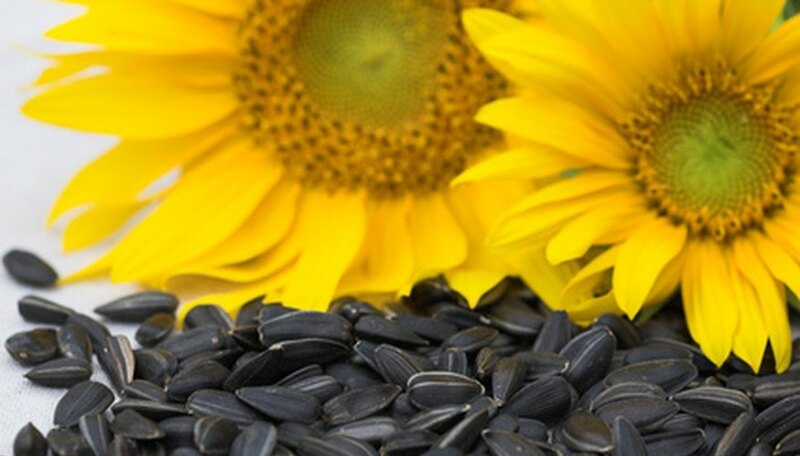 The oil in the sunflower seeds can go rancid during storage, especially if they are roasted. Alleviate this concern by storing seeds raw and only roasting small batches. The roasted batches can be stored in the freezer until ready to use.